SpaceBukkit provides a way to control a CraftBukkit Minecraft server through a web browser, so that you don’t need to always log in to the actual server console. It also provides a nice interface to manage the current players on your server, without having to actually log in to Minecraft, along with some other quite nifty features. However, it isn’t officially supported any more, as the developers are moving onto a newer version of this program. This guide is based on modified instructions from the SpaceBukkit documentation. Log in to your server with the username and password that you set up for the Minecraft user account, if you are not already logged into it. Type the following command and then press Enter. This installer file will try and download some files that look after the server. If there are problems, downloading the files, use nano to change the address of the first url to have “apricot” at the front of the domain name. Type the below command and press Enter, then once the modifications are made, press Ctrl + o to save and Ctrl + x to close. 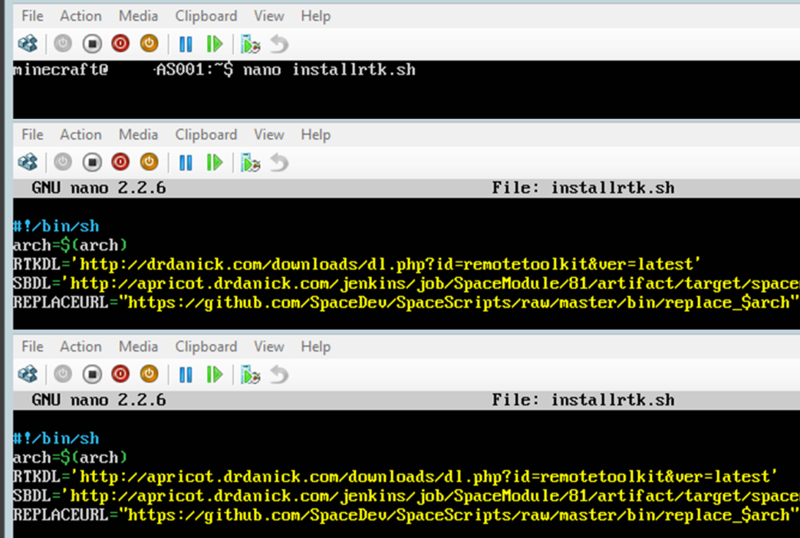 You can now start the SpaceBukkit installer by typing the below command and pressing Enter. 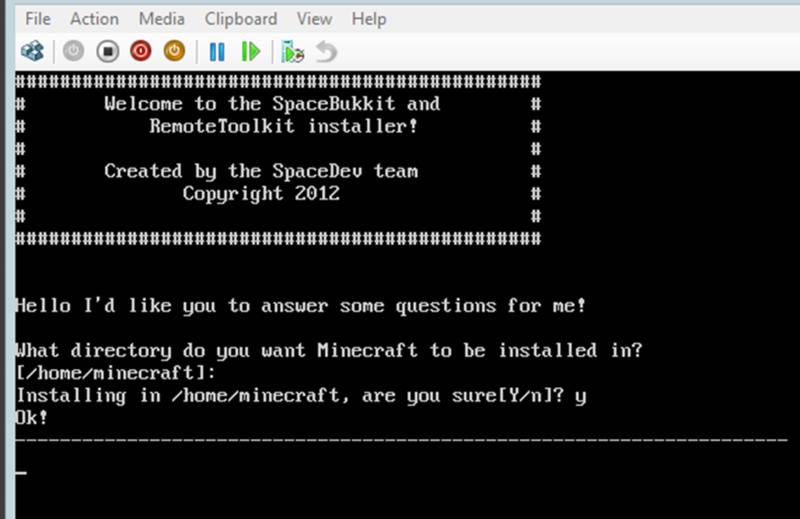 You will be asked where you want to install Minecraft, which needs to be the same as where the CraftBukkit file is. If you have been following this guide exactly, press Enter to accept the location that it has given you. Otherwise, type in a directory where the CraftBukkit file is located, then press Enter. Confirm that you are happy with this install location, by typing “Y” and pressing Enter. It will then say “OK” to let you know that it has confirmed your choice, and will then start to download some files. Wait a few minutes for this to happen, as no progress will be visible. You will be asked how much RAM that you would like to give the CraftBukkit server. Do not use the default value, as this will attempt to use all of the RAM in the server, but type in the amount of MegaBytes of RAM you want the server to use. I am intending to use 3GiB, which is 3072MiB. Change this value to suit your server, then press Enter. The rtktoolkit will now download, so wait for a bit. Ignore the fact that a file cannot be deleted, as it never existed in the first place. 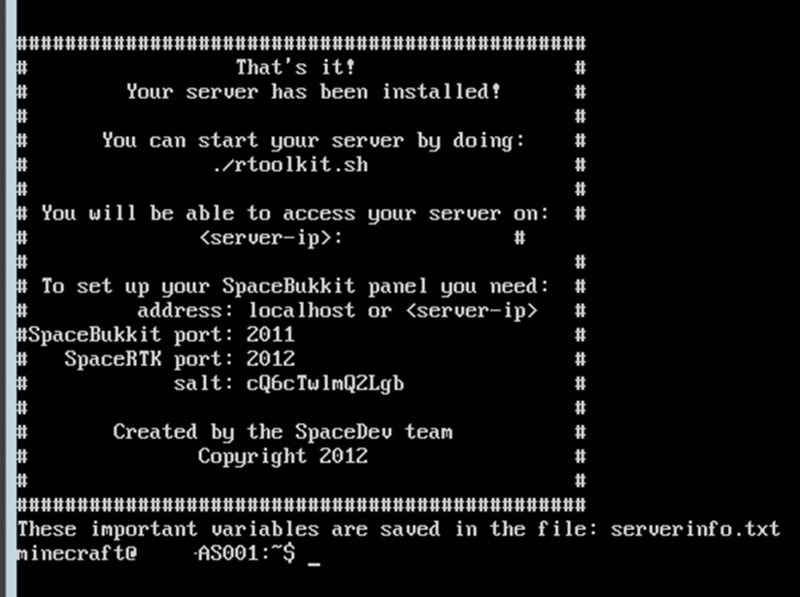 You will be prompted to download SpaceBukkit, so type “Y” and press Enter. When prompted for a SpaceBukkit port, leave it at the default 2011 and press Enter. 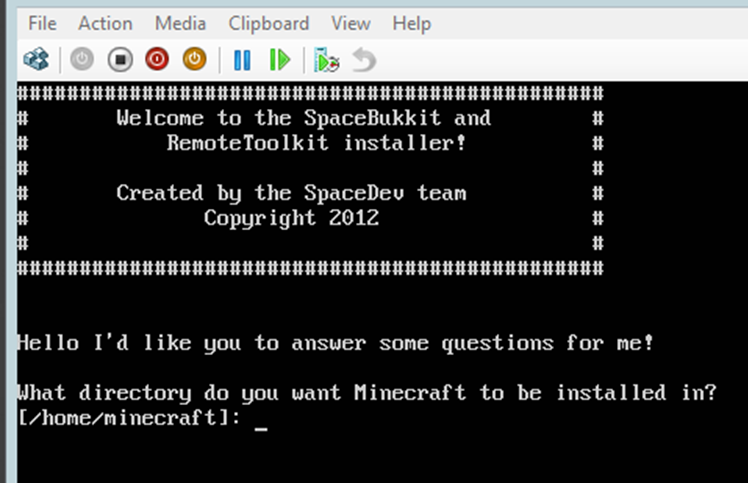 When asked for the SpaceRTK port, leave this as the default value of 2012, and press Enter. As there is currently no way to directly download CraftBukkit, there is no point in attempting to download it. Type “N” and then press Enter. 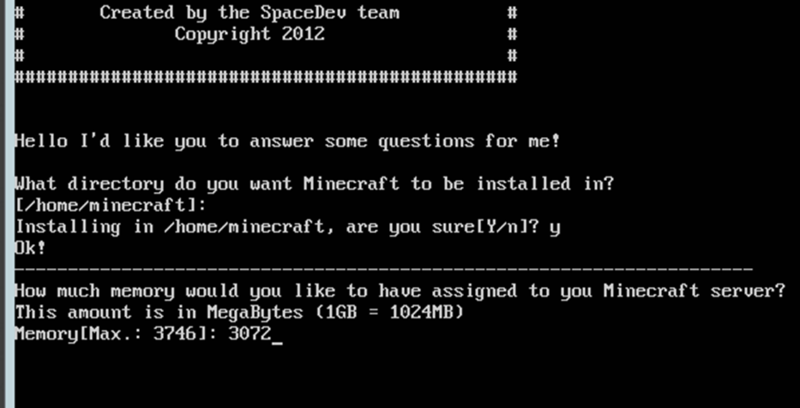 SpaceBukkit will now be installed, and will show a confirmation screen. Make sure to note down the salt, as you will need this later. This info is also saved in a file located at /home/minecraft/serverinfo.txt, just in case you need it again. Don’t forget to make a note of the salt! As we have compiled our own CraftBukkit server, we will need to copy this into a filename the server software is expecting. Type the following command and press Enter. Check that everything installed properly by typing the following command and press Enter. This will start the CraftBukkit server, with the Remote Toolkit being a wrapper around it. It will also update some files, so just wait for this to finish. When you have the prompt back again, type “.stopwrapper” and press Enter to shut down the server. You cannot use “stop” any more, as the Remote Toolkit changes this functionality (manual tab, step 4) to restart the server instead. 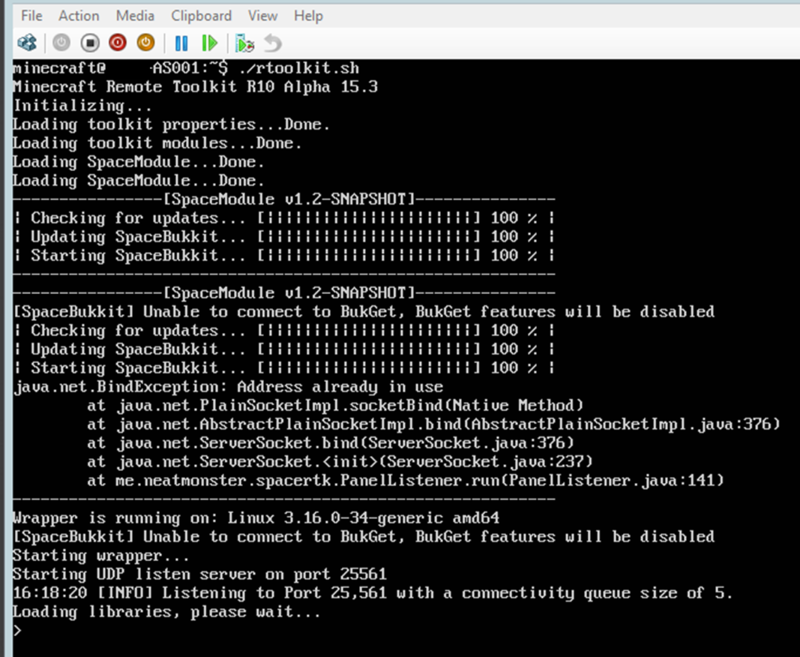 You now have a CraftBukkit server that can survive accidental crashes if you always start the rtoolkit script. While this is a useful thing to have, we may as well keep going and install the SpacePanel website, as we’ve installed the other needed files.